Mono-pipe ventilation exhaust centrifugal fans. Maximum air capacity up to 63 m³/h. Extract ventilation systems installed in high-rise buildings and premises.For buildings with mono-pipe ventilation system.For mounting in kitchens and bathrooms.Surface wall or ceiling mounting. Step speed control with an external speed controller, e.g. CDP-3/5 model which is available upon order.Wide range of intellectual controls programmable by set parameters (timer, adjustable timer, internal switch, photo sensor, humidity sensor). 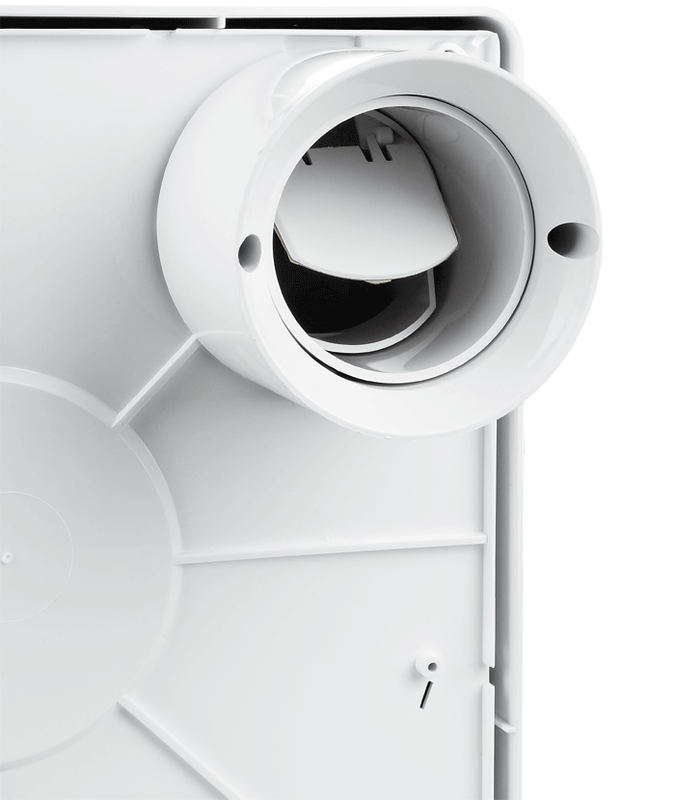 The fan consists of the plastic casing for surface mounting and exhaust ventilation unit Valeo with a flat front panel.The casing is made of durable ABS plastic and fitted with a gravity backdraft damper to prevent backdrafting. Flexible air duct connected to ductwork system and wiring are routed to the fan through wall or ceiling.After finishing works a flexible air duct is fixed on the fan spigot with clamps.Power is supplied to the fan through a sealed electric lead-in on the casing.The casing is installed at site with dowels and is adjusted vertically with oblong slotted joints.The ventilation unit connected to wiring system is installed in the mounted and fixed casing. 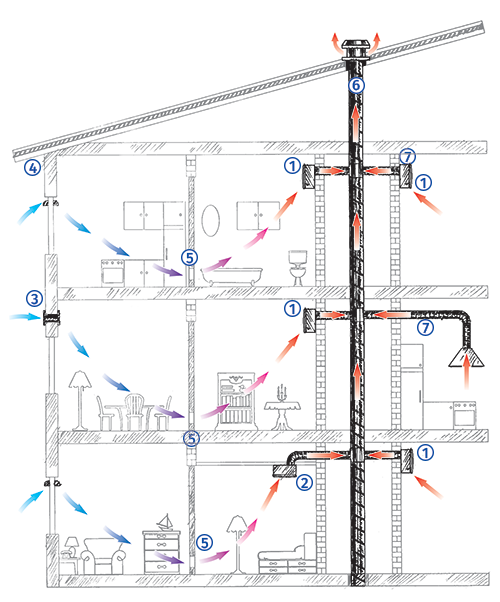 The mechanical centralized mono-pipe exhaust ventilation system for kitchens and bathrooms based on Valeo-E fans is specially designed for high-rise residential premises.Fresh air is supplied to bedrooms, children's room or living rooms through window or wall vents. Vent modifications with air volume regulation are available. Stale air is extracted by exhaust fans from the room through inside doors or door grilles in the kitchen, bathroom or WC.This ventilation system arrangement ensures non-stop controllable air circulation in the room, comfortable microclimate and high fire safety. 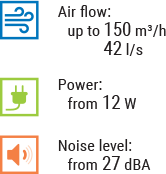 1 – Exhaust fan Valeo-E (surface mounting).2 – Exhaust fan Valeo-E (ceiling mounting).3 – BLAUBERG wall vent, WMH series.4 – BLAUBERG window vent, FHM series.5 – BLAUBERG ventilation grilles, DECOR series.6 – Central ventilation shaft.7 – Flexible air ducts for connection of exhaust fans to the central ventilation shaft, e.g. BLAUBERG air ducts, Blauflex series.